Internally, by default, Structured Streaming queries are processed using a micro-batch processing engine, which processes data streams as a series of small batch jobs thereby achieving end-to-end latencies as low as 100 milliseconds and exactly-once fault-tolerance guarantees. However, since Spark 2.3, we have introduced a new low-latency processing mode called Continuous Processing, which can achieve end-to-end latencies as low as 1 millisecond with at-least-once guarantees. Without changing the Dataset/DataFrame operations in your queries, you will be able to choose the mode based on your application requirements. In this guide, we are going to walk you through the programming model and the APIs. We are going to explain the concepts mostly using the default micro-batch processing model, and then later discuss Continuous Processing model. 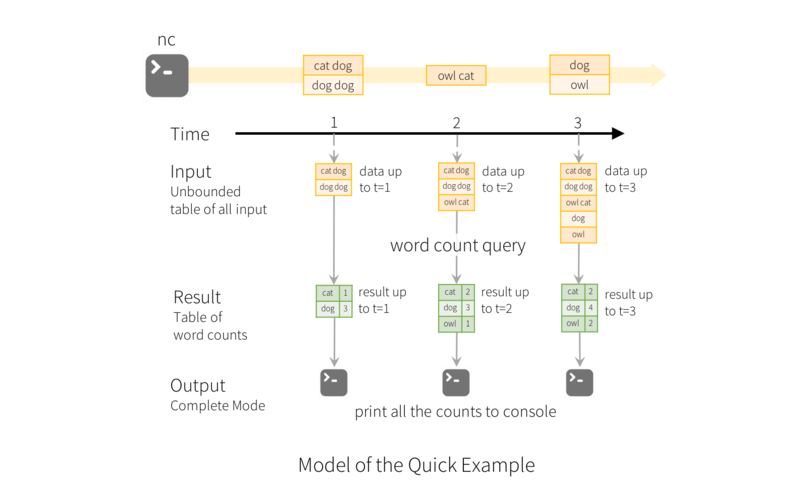 First, let’s start with a simple example of a Structured Streaming query - a streaming word count. File source - Reads files written in a directory as a stream of data. Supported file formats are text, csv, json, orc, parquet. See the docs of the DataStreamReader interface for a more up-to-date list, and supported options for each file format. Note that the files must be atomically placed in the given directory, which in most file systems, can be achieved by file move operations. However, to run this query for days, it’s necessary for the system to bound the amount of intermediate in-memory state it accumulates. This means the system needs to know when an old aggregate can be dropped from the in-memory state because the application is not going to receive late data for that aggregate any more. To enable this, in Spark 2.1, we have introduced watermarking, which lets the engine automatically track the current event time in the data and attempt to clean up old state accordingly. You can define the watermark of a query by specifying the event time column and the threshold on how late the data is expected to be in terms of event time. For a specific window starting at time T, the engine will maintain state and allow late data to update the state until (max event time seen by the engine - late threshold > T). In other words, late data within the threshold will be aggregated, but data later than the threshold will start getting dropped (see later in the section for the exact guarantees). Let’s understand this with an example. We can easily define watermarking on the previous example using withWatermark() as shown below. It is important to note that the following conditions must be satisfied for the watermarking to clean the state in aggregation queries (as of Spark 2.1.1, subject to change in the future). A watermark delay (set with withWatermark) of “2 hours” guarantees that the engine will never drop any data that is less than 2 hours delayed. In other words, any data less than 2 hours behind (in terms of event-time) the latest data processed till then is guaranteed to be aggregated. However, the guarantee is strict only in one direction. 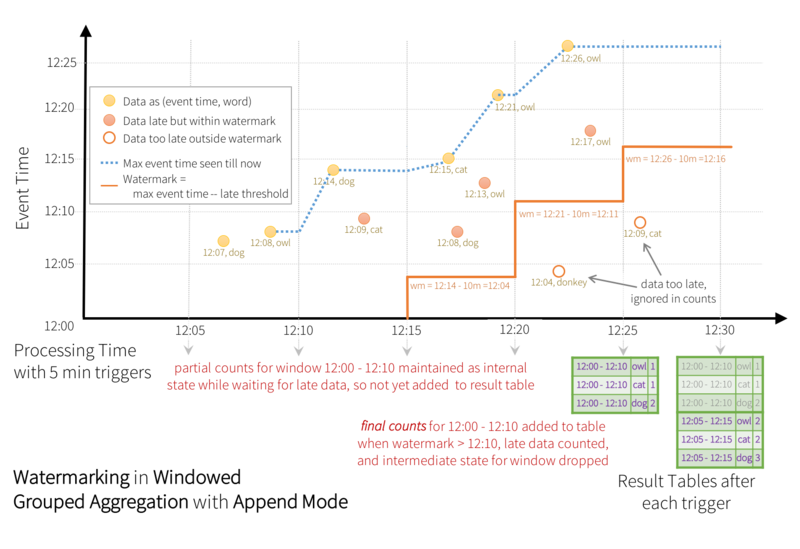 Data delayed by more than 2 hours is not guaranteed to be dropped; it may or may not get aggregated. More delayed is the data, less likely is the engine going to process it. Structured Streaming supports joining a streaming Dataset/DataFrame with a static Dataset/DataFrame as well as another streaming Dataset/DataFrame. The result of the streaming join is generated incrementally, similar to the results of streaming aggregations in the previous section. In this section we will explore what type of joins (i.e. inner, outer, etc.) are supported in the above cases. Note that in all the supported join types, the result of the join with a streaming Dataset/DataFrame will be the exactly the same as if it was with a static Dataset/DataFrame containing the same data in the stream. Since the introduction in Spark 2.0, Structured Streaming has supported joins (inner join and some type of outer joins) between a streaming and a static DataFrame/Dataset. Here is a simple example. Note that stream-static joins are not stateful, so no state management is necessary. However, a few types of stream-static outer joins are not yet supported. These are listed at the end of this Join section. In Spark 2.3, we have added support for stream-stream joins, that is, you can join two streaming Datasets/DataFrames. The challenge of generating join results between two data streams is that, at any point of time, the view of the dataset is incomplete for both sides of the join making it much harder to find matches between inputs. Any row received from one input stream can match with any future, yet-to-be-received row from the other input stream. Hence, for both the input streams, we buffer past input as streaming state, so that we can match every future input with past input and accordingly generate joined results. Furthermore, similar to streaming aggregations, we automatically handle late, out-of-order data and can limit the state using watermarks. Let’s discuss the different types of supported stream-stream joins and how to use them. Inner joins on any kind of columns along with any kind of join conditions are supported. However, as the stream runs, the size of streaming state will keep growing indefinitely as all past input must be saved as any new input can match with any input from the past. To avoid unbounded state, you have to define additional join conditions such that indefinitely old inputs cannot match with future inputs and therefore can be cleared from the state. In other words, you will have to do the following additional steps in the join. 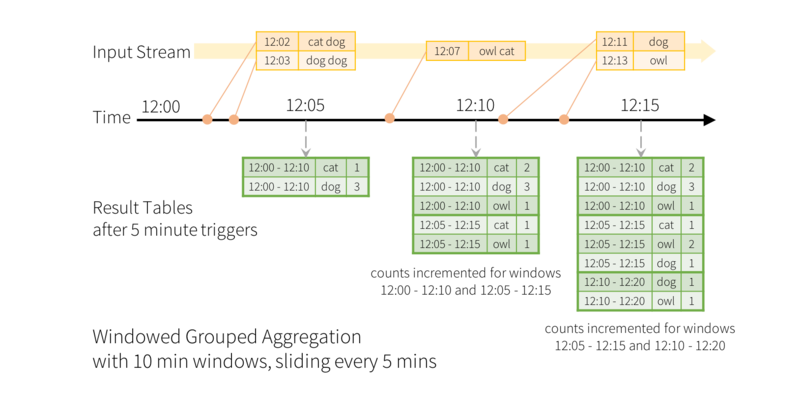 Define a constraint on event-time across the two inputs such that the engine can figure out when old rows of one input is not going to be required (i.e. will not satisfy the time constraint) for matches with the other input. This constraint can be defined in one of the two ways. Join on event-time windows (e.g. ...JOIN ON leftTimeWindow = rightTimeWindow). Let’s say we want to join a stream of advertisement impressions (when an ad was shown) with another stream of user clicks on advertisements to correlate when impressions led to monetizable clicks. To allow the state cleanup in this stream-stream join, you will have to specify the watermarking delays and the time constraints as follows. Watermark delays: Say, the impressions and the corresponding clicks can be late/out-of-order in event-time by at most 2 and 3 hours, respectively. Event-time range condition: Say, a click can occur within a time range of 0 seconds to 1 hour after the corresponding impression. "clickTime <= impressionTime + interval 1 hour"
This is similar to the guarantees provided by watermarking on aggregations. A watermark delay of “2 hours” guarantees that the engine will never drop any data that is less than 2 hours delayed. But data delayed by more than 2 hours may or may not get processed. While the watermark + event-time constraints is optional for inner joins, for left and right outer joins they must be specified. This is because for generating the NULL results in outer join, the engine must know when an input row is not going to match with anything in future. Hence, the watermark + event-time constraints must be specified for generating correct results. Therefore, a query with outer-join will look quite like the ad-monetization example earlier, except that there will be an additional parameter specifying it to be an outer-join. joinType = "leftOuter"      // can be "inner", "leftOuter", "rightOuter"
"leftOuter"                 // can be "inner", "leftOuter", "rightOuter"
"leftOuter"                 # can be "inner", "leftOuter", "rightOuter"
"left_outer"                 # can be "inner", "left_outer", "right_outer"
Outer joins have the same guarantees as inner joins regarding watermark delays and whether data will be dropped or not. There are a few important characteristics to note regarding how the outer results are generated. The outer NULL results will be generated with a delay that depends on the specified watermark delay and the time range condition. This is because the engine has to wait for that long to ensure there were no matches and there will be no more matches in future. In the current implementation in the micro-batch engine, watermarks are advanced at the end of a micro-batch, and the next micro-batch uses the updated watermark to clean up state and output outer results. Since we trigger a micro-batch only when there is new data to be processed, the generation of the outer result may get delayed if there no new data being received in the stream. In short, if any of the two input streams being joined does not receive data for a while, the outer (both cases, left or right) output may get delayed. Joins can be cascaded, that is, you can do df1.join(df2, ...).join(df3, ...).join(df4, ....). As of Spark 2.3, you can use joins only when the query is in Append output mode. Other output modes are not yet supported. As of Spark 2.3, you cannot use other non-map-like operations before joins. Here are a few examples of what cannot be used. Cannot use streaming aggregations before joins. Cannot use mapGroupsWithState and flatMapGroupsWithState in Update mode before joins. Few types of outer joins on streaming Datasets are not supported. See the support matrix in the Join Operations section for more details. Queries with joins Append Update and Complete mode not supported yet. See the support matrix in the Join Operations section for more details on what types of joins are supported. The trigger settings of a streaming query defines the timing of streaming data processing, whether the query is going to executed as micro-batch query with a fixed batch interval or as a continuous processing query. Here are the different kinds of triggers that are supported. unspecified (default) If no trigger setting is explicitly specified, then by default, the query will be executed in micro-batch mode, where micro-batches will be generated as soon as the previous micro-batch has completed processing. Fixed interval micro-batches The query will be executed with micro-batches mode, where micro-batches will be kicked off at the user-specified intervals. If the previous micro-batch completes within the interval, then the engine will wait until the interval is over before kicking off the next micro-batch. If the previous micro-batch takes longer than the interval to complete (i.e. if an interval boundary is missed), then the next micro-batch will start as soon as the previous one completes (i.e., it will not wait for the next interval boundary). If no new data is available, then no micro-batch will be kicked off. One-time micro-batch The query will execute *only one* micro-batch to process all the available data and then stop on its own. This is useful in scenarios you want to periodically spin up a cluster, process everything that is available since the last period, and then shutdown the cluster. In some case, this may lead to significant cost savings. (experimental) The query will be executed in the new low-latency, continuous processing mode. Read more about this in the Continuous Processing section below. Continuous processing is a new, experimental streaming execution mode introduced in Spark 2.3 that enables low (~1 ms) end-to-end latency with at-least-once fault-tolerance guarantees. Compare this with the default micro-batch processing engine which can achieve exactly-once guarantees but achieve latencies of ~100ms at best. For some types of queries (discussed below), you can choose which mode to execute them in without modifying the application logic (i.e. without changing the DataFrame/Dataset operations). 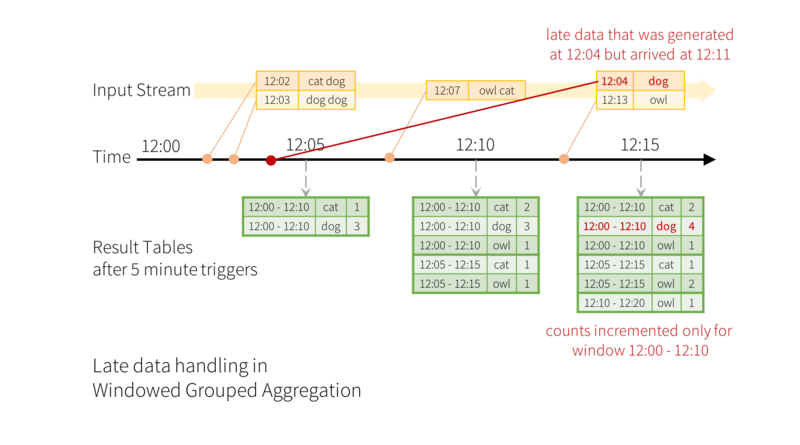 A checkpoint interval of 1 second means that the continuous processing engine will records the progress of the query every second. The resulting checkpoints are in a format compatible with the micro-batch engine, hence any query can be restarted with any trigger. For example, a supported query started with the micro-batch mode can be restarted in continuous mode, and vice versa. Note that any time you switch to continuous mode, you will get at-least-once fault-tolerance guarantees. As of Spark 2.3, only the following type of queries are supported in the continuous processing mode. Operations: Only map-like Dataset/DataFrame operations are supported in continuous mode, that is, only projections (select, map, flatMap, mapPartitions, etc.) and selections (where, filter, etc.). All SQL functions are supported except aggregation functions (since aggregations are not yet supported), current_timestamp() and current_date() (deterministic computations using time is challenging). Kafka source: All options are supported. Rate source: Good for testing. Only options that are supported in the continuous mode are numPartitions and rowsPerSecond. Kafka sink: All options are supported. Memory sink: Good for debugging. Console sink: Good for debugging. All options are supported. Note that the console will print every checkpoint interval that you have specified in the continuous trigger. See Input Sources and Output Sinks sections for more details on them. 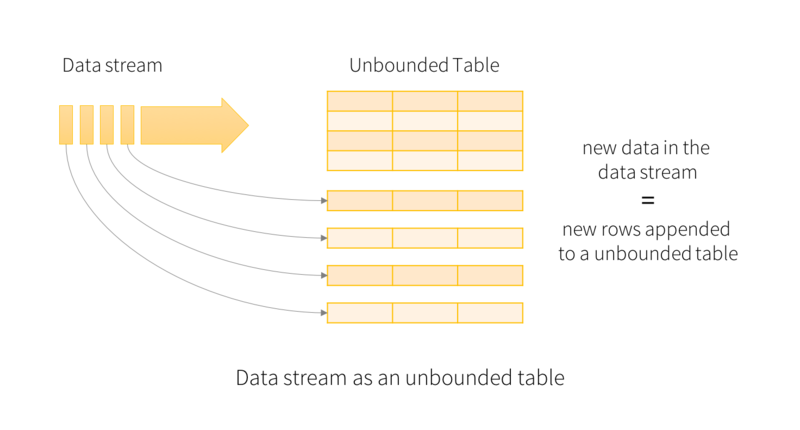 While the console sink is good for testing, the end-to-end low-latency processing can be best observed with Kafka as the source and sink, as this allows the engine to process the data and make the results available in the output topic within milliseconds of the input data being available in the input topic. 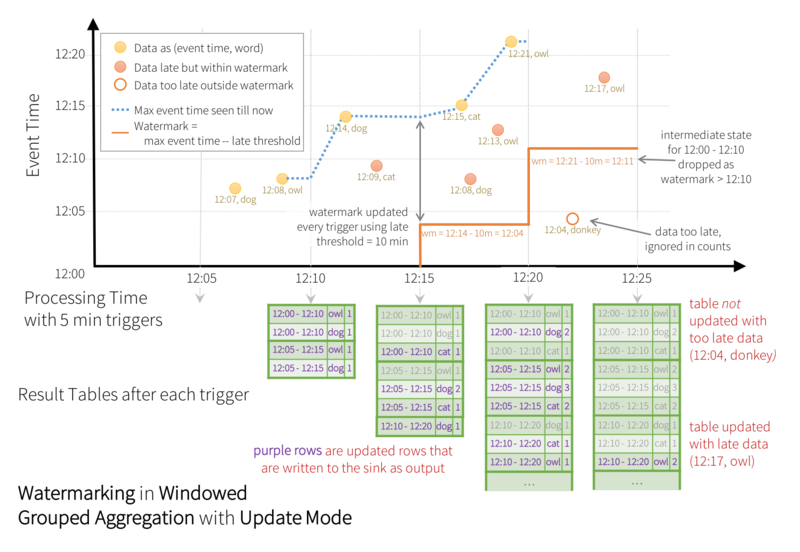 Continuous processing engine launches multiple long-running tasks that continuously read data from sources, process it and continuously write to sinks. 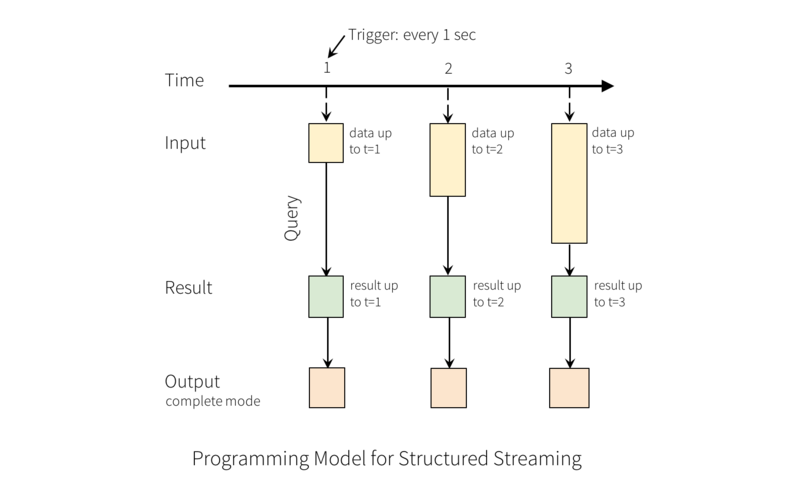 The number of tasks required by the query depends on how many partitions the query can read from the sources in parallel. Therefore, before starting a continuous processing query, you must ensure there are enough cores in the cluster to all the tasks in parallel. For example, if you are reading from a Kafka topic that has 10 partitions, then the cluster must have at least 10 cores for the query to make progress. Stopping a continuous processing stream may produce spurious task termination warnings. These can be safely ignored. There are currently no automatic retries of failed tasks. Any failure will lead to the query being stopped and it needs to be manually restarted from the checkpoint.